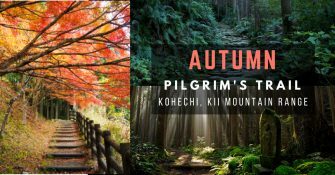 Kohechi route is a rugged and mountainous trail which cuts through the Kii Peninsular from South to North for about 70km. The route is characterised by steep trails that cross over 3 passes of over 1000 meters elevation. It connects the Hongu Taisha Shrine to the mountain top Buddhist temple complex of Mount Koya. It is an isolated walk compared to other trails in the Kumano Kudo area. But, you will enjoy the endless enchantment and quietness through the woods. Meet at Kansai Airport. We will start heading to the trek from Tennoji (Kii Tanabe at 1235pm) and eventually meet up with the guide at Hongu Taisha. We will then begin our 73km trek along the Kohechi Trail. The walk between Hongu and Totsukawa will stretch for 15km and will take us 7 hours and 30 mins. Hongu Taisha is the starting point of our trek. Hongu Taisha is one of Kumano region’s three famous shrines and it serves as the head shrine of over 3000 shrines across Japan. Reference to Hongu Taisha was first documented in the 9th century. At the temple we will receive the first stamp of our pilgrim’s journey. We will walk up to the high pass of Hatenashi-toge at 1,114 meters before descending to the village of Totuskawa where we will stay at an Onsen resort. Today will be a slightly longer walk of 19.2km. It will take us 7 hours 50 minutes. This will be the longest walk of our pilgrim’s journey. We will come across an old abandoned tea house on one of the mountain passes. This will give us a good feel as to how pilgrims travelled centuries ago. Besides trekking in the forest, we will also be walking sections of country side roads absorbing the culture of country living in Japan. We will go through the high pass of Miura-toge at 1,080 meters before descending into the village of Miura-guchi where we will stay at a Japanese inn. We will continue our trek between Miuraguchi to Nosegawa for 18.7km. By now you would realize how quiet and secluded this trail is. This gives you a chance to free all your thoughts and worries and leave everything to God. We will cross over the highest pass in our journey of 1246 meters. Today’s walk will be 18.7 km and will take us 6 hours 30 minutes. We will come across access to clear spring water where we can taste the freshness of the mountains. This water source is also used by the local sake brewery. We will end our day at the village of Omata. We will stay at a Japanese inn where if we are lucky may have some wild boar steamboat or fish freshly caught from the nearby river. The last stretch of our journey brings us up the the world heritage hill temple settlement of Koya San. The walk today is 16.8 km and takes 6 hours and 40 minutes. We will be staying the night in a temple and experience temple life and vegetarian cuisine. The many temples have beautifully manicured grounds and peaceful to just sit there and contemplate. This will also mark the end of our journey. After breakfast, we will head back to Osaka on our onward flight home.